Yonkers firefighters rescue two dogs from a burning apartment building. 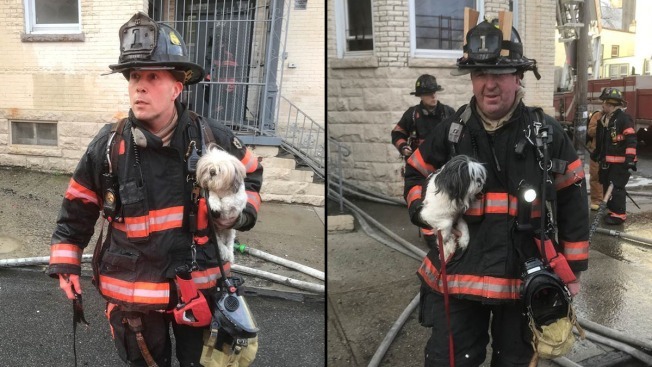 Firefighters rescued two dogs from a burning apartment in Yonkers on Saturday afternoon, officials said. The fire broke out on the first floor of the apartment on Hawthorne Avenue just before 3 p.m., the Yonkers Fire Department said. The blaze spread to the second floor. All the residents were able to get out, but firefighters rescued two small dogs. Five civilians and four firefighters suffered minor injuries. About 25 residents were relocated to a temporary shelter at St. Peter's School.